*Percentage of the US Recommended Daily Allowance for adults and children four or more years of age. Zinc does quite a bit for the body. 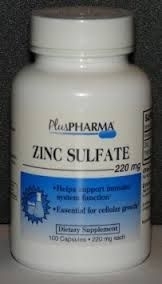 First, Zinc is crucial for health because it strengthens the immune system. It is also essential to cell division, growth, and repair. Zinc plays an important role in the detoxification of alcohol in the liver, aides in digestion, and increases the production of protein. Second, it is involved in over 200 enzymatic reactions, and aides the body in the actions of several hormones, such as growth hormone, testosterone, insulin, and estrogen. *. Take 1 CAPSULE daily with water, preferably at bedtime as a dietary supplement or as directed by a doctor. Store at room temperature; keep lid tightly closed in a dry place. Do not use if blister seal is cut, torn, or broken. Gelatin, magnesium stearate, rice flour.